One criticism I see about Netflix is complaints that they aren’t getting as much “good movies” these days. That could be true. We’ve been long time subscribers (back when basically everything was on Netflix on the roku because they hadn’t hammered out those rights yet). In any case, in my opinion, whether or not Netflix has “good movies” is not only subjective, but it kind of comes and goes. For example, coming to Netflix in March are “good movies” like Beerfest (whatever), Casino, Ghostbusters, Revolutionary Road and Little Women. Among others. But, where Netflix is excelling, in my opinion, is in their original productions. I read a comment on-line where an older person said that Netflix couldn’t survive because no one wanted to see their original programming, but I can’t disagree more. Netflix is consistently making GREAT shows and the one I’m reviewing today will be the first in a line. Originally Aired: Mortified Nation is a 2013 documentary based on the stage show and podcast Mortified: Share the Shame. 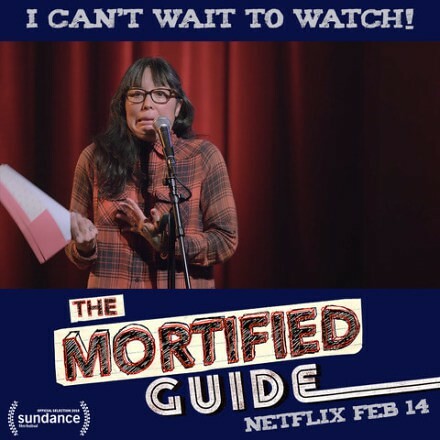 The Mortified Guide is a Netflix production. Well, part of the point of Mortified is that it’s pretty much every day people. I suspect there are some comics or bloggers or something that may be familiar to some people, but the “starring roles” are all people you probably don’t know. Summary: The Mortified suite is basically predicated on people reading from their childhood journals. The topics range from secret crushes to their longing to fit in to their family dysfunction to them struggling with their sexuality. They are this very revealing, honest, sometimes humiliating look into what life felt like as a tween and teen. It was definitely the sort of series where I’d be doubled over laughing and then wiping away tears with the next story. I loved not only remembering myself and parts of me that I’d lost along the way, but looking at the teenage experience happening in my house with fresh eyes. We actually made the Princess sit down and watch with us. Not because we wanted to embarrass the life out of her, but because I was hoping that she’d see that her thoughts and feelings and experiences aren’t that much differences than the authors who were sharing their stories. Mortified’s tagline is “We’re all freaks, we’re all fragile and we all survived” which I think is meaningful when looking back on the tween/teen experience. Previous Post Reducing Screen time–and the menu plan!